Are you being sued or is your business in need of a highly-skilled civil litigation attorney to resolve a dispute? 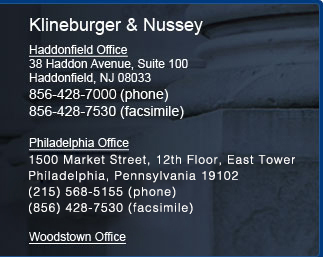 At the law firm of Klineburger & Nussey, we provide strong representation in civil litigation cases involving contract and shareholder disputes, legal malpractice, defamation, catastrophic personal injury, wrongful death, and real estate. From law offices in Haddonfield, New Jersey, and Philadelphia, Pennsylvania, our attorneys leave no stone unturned in constructing our client's cases. We are adept at handling complex civil litigation cases involving individuals and large companies at both the trial and appellate court level. Call (856) 428-7000 for an initial consultation with an experienced civil litigation lawyer for Personal Injury matters only and a reduced rate initial consultation for all other civil litigation matters or send us an e-mail. We represent businesses in civil litigation cases involving breach of contract, partnership disputes, wrongful termination, employment law issues, trademark infringement, and shareholder disputes, among others. If your case was defeated due to legal malpractice, our law firm can help you obtain justice. Our civil litigation lawyers handle cases involving missed statutes of limitations, conflicts of interest, negligence, and general incompetence. If the negligence of another has left you severely injured or caused the loss of a loved one, we can help. Our firm handles complex litigation involving catastrophic personal injuries and wrongful death. Our lawyers assist clients in real estate closings, as well as represent them in civil litigation involving buyer-seller disputes, fraud, and misrepresentation.